And of course, we will be welcoming the country for our final tournament that is sponsored by the Spikeball™ Roundnet Association as part of their National Tour! Individuals in the Advanced division will earn points based on how well they perform at each Utah Tour Stop. At the end of the year, we have been planning for some big prizes you will want to fight for: namely a sponsorship to compete at Spikeball™ Nationals that comes with some financial support to help you get there! Because the Championship Tournament is combining with the Spikeball Tour Event, the top Utah team will get points associated for 1st place and it will count down from there but will not skip further non-Utah teams (ie: Top Utah team takes 3rd place = 175 points, next Utah team takes 5th = 100 points). The more tournaments you play in, the more you can rack up those points! Each tournament will have some random prize drawings from sponsors, and of course the winning teams will have prizes of their own - including some highly coveted glassware. We are adding more excitement for the top 5 ranked Advanced players and the top Coed team at the end of the Tour Series. 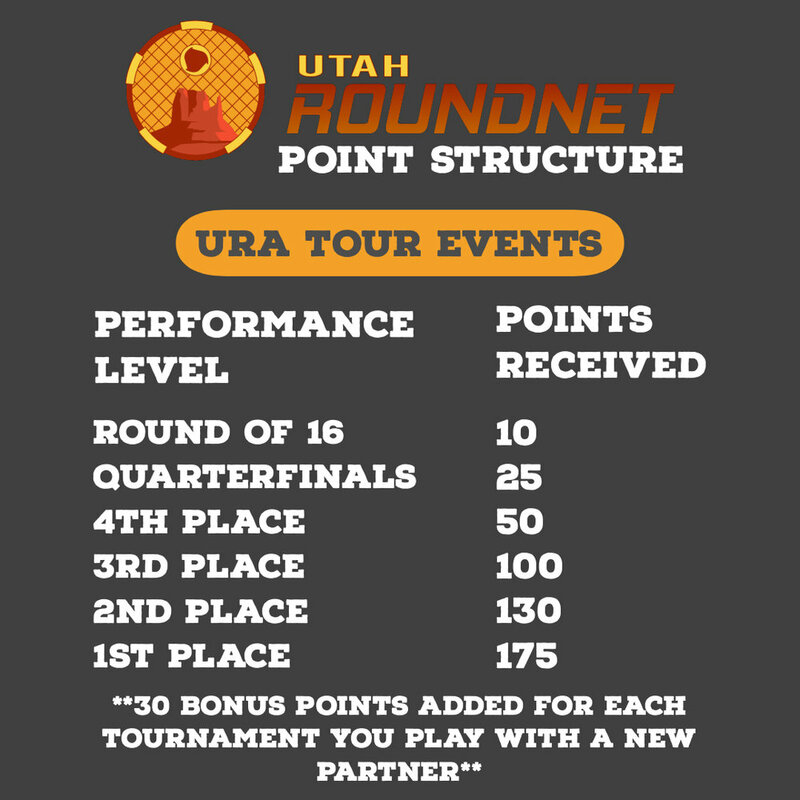 Utah Roundnet will sponsor your trip to Nationals and offer financial support to get you there! *Players not participating in Spikeball™ Nationals can opt for a cash prize worth half the sponsorship. **Any tiebreakers at the end of the season will be decided by the Championship tournament results. ***If 2 teammates tie and play together at the Championship tournament, they will split the 2 prizes. ie: If 2 teammates tied for 1st place, each would receive a $250 sponsorship. Each tournament may require a different type of format depending on numbers of teams registered among other factors. Be aware that a tournament format may be different than outlined above and may include division splits for bracket play, double elimination brackets. We want to retain this flexibility to ensure we can adapt to the best solution for each tournament. NO DAY OF TOURNAMENT SIGN UPS WILL BE ALLOWED. We’re sorry, but it ruins the pools/brackets for the rest of the teams as they are put together the night before. Registration links will be closed at 10PM the night prior. Which division should I register for? Womens: Two-female teams will register for free all season long! You will still need to fill out the online registration (and unfortunately pay the $3 online “convenience” fee, sorry we couldn’t get around that). Beginner: This is for those who are very new to the sport. Playing for fun and learning the rules. Gentlemen’s serving rules will be enforced (if you can serve hard, this isn’t the division for you anyway). Division Promotions Rules: Teams that take 1st place in the beginners division will be required to promote to Intermediate division at future tournaments. The top 2 teams from the Intermediate division will be required to promote to the Advanced division at future tournaments. We want to be sure that no teams are sandbagging it in lower divisions in order to win - after all, you will only get better if you play better teams! Any player that places in the top 8 teams in the Advanced division in any URA tournament will not be allowed to play in an Intermediate bracket, even with another teammate. We also reserve the right to deny any player to play in a specific devision if we deem them too skilled.